AMS-Merlo has 18 model lines available for 2018. This month, we begin a series of available Merlo models. First up: Merlo’s Compact model, the P27.6Plus. It is compact (footprint: 12’8” x 6’ x 6’3”) yet nimble. The small and mighty P27.6Plus could park in your garage, as well as in the shop. This Merlo compact model is very popular across industries. For our Ag and Green customers, it fits through low threshold doorways, such as in poultry houses, and it easily loads on a trailer to be towed by heavy-duty pickups. It’s growing in popularity for material handling as well. 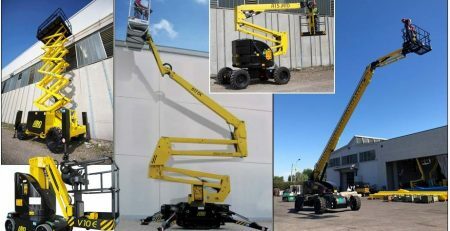 The capability to take a jib with winch, for example, combined with its lift and reach capability for placing loads is making the P27.6Plus a viable addition to supply yards and construction sites, both commercial and residential. The P27.6Plus, like all Merlos, is ground engaging and can take many attachments such as jibs, jibs with winches (mentioned above), buckets up to 1.75 yards (empty weight 1,200lbs. ), a variety of forks, clamps and a two-person manbasket (optional; preprogrammed from the factory). Hooking up attachments is simple and quick; another Merlo plus. Once an attachment is put in place, the electronic sensing systems go into action. Like all telehandlers in the Merlo lineup, the P27.6Plus can claim the following safety features and benefits: 360 degree operator visibility (including up through the roof), thanks to that low pivot boom; load sensing hydraulics (for some competitors, this is still an option); the electronically controlled hydrostatic transmission provides inching precision; the 4-wheel drive with three steering modes makes it possible for maneuvering in constricted environments. All boom mechanical parts, electrical and hydraulic lines are enclosed within the boom structure. Merlo is always looking for ways to make their already awesome machines even better. For 2018, Merlo’s cabs are modular in design. Still the largest cab in its respective class (the P27.6Plus is a roomy 3’3” wide) the cab now boasts a curved windshield enlarging the already expansive viewing area. Merlo engineers took two pages from the automotive industry. They streamlined the dashboard for intuitive access to the machine’s controls and reengineered the entire airflow system. The real estate on the driver’s side of the cab now holds larger air filters. This placement brings improved quantity and quality air flow, plus ease of filter cleaning and replacement. In factory tests against similar telehandlers, the compact P27.6Plus outperforms front loaders in terms of height, operating boom speed and productivity. WE WANT TO MAKE YOU (ALMOST) FAMOUS! The AMS Marketing Department promotes Merlos through Facebook, Twitter, Instagram, print and digital media, press releases, case studies, testimonials –and this newsletter! Merlo, as a brand, is growing in prevalence across industry platforms. As a result, we receive inquiries from leading trade magazines looking for factual information, quotes, and photos about Merlos. They are always looking for photos. Though our photo library is good, it needs some refreshing. This is where we can make you (almost) famous. Send us your Merlo photos. Your photos will enhance our marketing endeavors by showing Merlos doing what Merlos do best here in the USA: working in the field and on the job site.Yes, you can take usable photos. Smartphone cameras can do A LOT: Photos, video (hint, hint) and sound recordings. If your customer is amiable to speaking to the press (or us as we craft stories) please provide the company name, contact name, email address, and phone number. Send your photos to marketing@appliedmach.com. Include your business and contact information as well. We want to give credit where credit is due. Questions? Call Susan at 803-327-4949. Looking forward to seeing what you see out in the Merlo field! Thank you!